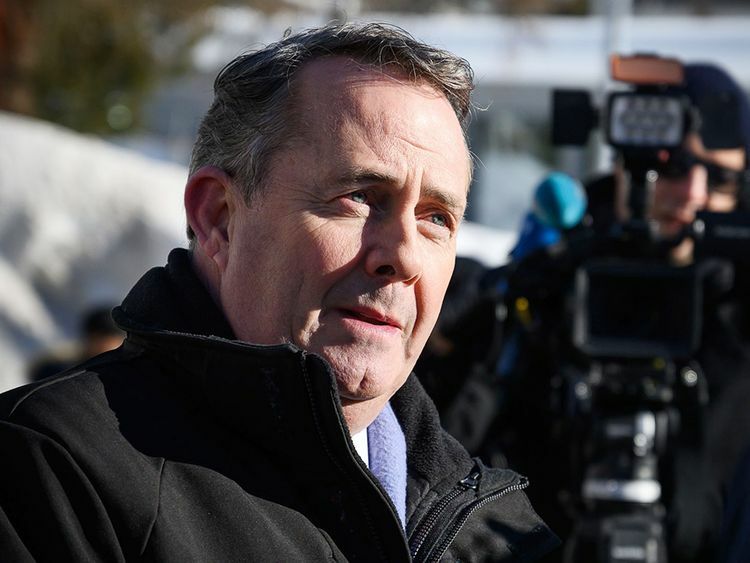 Davos (Switzerland): Britain’s pro-Brexit trade chief Liam Fox came to Davos Wednesday to sell a vision of “GREAT” free trade even if many in parliament are aghast at where the country is going. Interviewed by journalists at the World Economic Forum, the international trade secretary said Britain remains a world-leading destination for foreign investment despite Brexit clouds and the departure of a number of companies. He welcomed a proposal by Poland that could potentially unblock a problem surrounding the Irish border that is holding up a deal on Britain’s exit from the European Union. Many of Fox’s parliamentary colleagues, including in his own Conservative Party, have stressed they will do all they can to avoid a “hard” Brexit in March. But given the risk of Britain crashing out of the EU without a deal, Fox said he expected soon to sign several pacts with trading partners outside Europe to try to ensure a seamless transition. He shrugged off news that Sony has joined the drift of companies, especially from Japan, that are shifting the registration of their European headquarters, if not operations, out of Britain. Instead he pointed to figures from the consultancy Deloitte showing Britain has attracted more foreign investment than Germany and France combined since it voted to quit the EU in 2016. “So clearly the UK is open for business and is an attractive destination for foreign direct investment - and that during the time where there’s been uncertainty over Brexit,” he said. Polish Foreign Minister Jacek Czaputowicz broke ranks with the rest of the EU this week by suggesting a time-limit of five years might be possible on the so-called Irish backstop as a way to “unblock negotiations” between London and Brussels. Fox commented: “I welcome constructive thinking on this. The prime minister [Theresa May] has made it very clear that we will welcome any option that might enable us to deal with the backstop issue. In case of no deal, Fox has won agreements with Australia, New Zealand, Chile and Switzerland to ensure mutual recognition of standards in goods trade, providing a bridge to new trading regimes for Britain outside the EU. He has admitted that he will fall short of his previous boasts that some 40 such pacts would be ready the day after Brexit. “There are a number that we expect to be signing over the next month or so,” he said, declining to say how many. During his two days in Davos, Fox is meeting with trade ministers from South Korea, Hong Kong, Canada, Colombia and Israel. He is also overseeing a striking visual campaign in Davos to underline Britain’s historic record on trade, playing on a long-running tourism campaign that emphasises the “Great” in Great Britain. Fox conceded that some trading partners do not see the point of negotiating stop-gap arrangements, as they are unconvinced that Britain will fail to reach a deal with the EU. “My view to them is, don’t take the chance, because it [no deal] could happen. It’s maybe unlikely, but businesses will never criticise you for being over-prepared. If it does fail to clinch agreement with the EU, Britain would revert to basic rules set by the World Trade Organisation to manage its export and import of goods. While that is the preferred fallback option of Brexiteers such as Fox, some WTO members in Geneva have reportedly balked at simply translating Britain’s EU commitments into a new document, arguing it would give London advantageous terms. Fox said such objections were a “red herring” as the EU itself had never traded under certified WTO commitments, known as schedules. “We are very clear, having set our schedules out, that the UK intends to be a very open economy and we intend to use our independent seat at the World Trade Organisation to push for greater liberalisation,” he said.